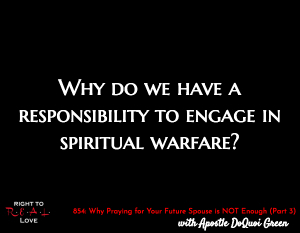 In this episode, Jay continues his discussion with spiritual warfare specialist Apostle DoQuoi Green by addressing the question: Why do we have a responsibility to engage in spiritual warfare? Why do we have a responsibility to engage in spiritual warfare? How spiritual warfare impacts our lives. The importance of having a spiritual perspective of life. Why godly character and obedience are vitally important. How to engage in spiritual warfare. Apostle Green explains why believers in Jesus Christ have a responsibility to engage in spiritual warfare. Apostle Green explains how to engage in spiritual warfare. Decide to begin praying on the level of your promotion. Invest in yourself by watching Apostle Green’s teaching on praying on the level of your promotion.